We’ve been looking for ways to incorporate more sweet potato into our meals… and there’s no such thing as too much black bean! This is a modification of this recipe over at Eating Well. This is a beautiful dish! Precook: microwave the whole sweet potatoes for 3-4 minutes before dicing, just to soften them a bit. 1. In a large pot, saute the oil, onions and potato over medium-high heat, stirring often, until the onion is slightly softened. 2. Add garlic, chili powder, cumin, chipotle and salt and cook, stirring constantly, until fragrant, about 30 seconds. 3. 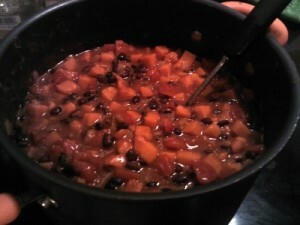 Add 2 2/3 cup water, beans, tomatoes and lime juice; increase heat to high and bring to a simmer, stirring often. Cover, reduce heat to maintain a gentle simmer and cook 14-18 minutes. Garnish with cilantro and plain yogurt or sour cream (dairy or vegan). Serve with warm tortillas, chips, rice or quinoa. 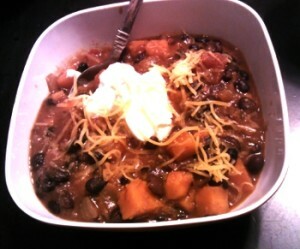 The coolness of a little yogurt (or sour cream) is a wonderful complement to the sweet heat of the chili.